Easter is right around the corner and what exactly does that mean? It means a gang buster sale of the famous candy made in Lehigh Valley&apos;s city of Bethlehem, Pa., Peeps, of course! Peeps are notorious all over the world it seems. 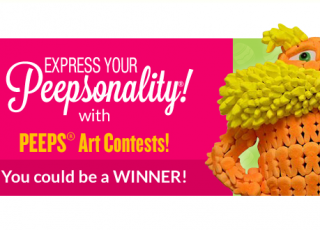 Each year, I write a blog post and incorporate some of the best videos, recipes, national headlines, contests and more, and each year I am blown away by the creativity and the oddness of some people for their “creations” utilizing Peeps. 1. Don’t throw away those leftover Peeps! Use them in some of these yummy looking treat concoctions. How long does a Peep last anyway? I’m pretty sure unopened it would be years! 2. These cupcake treats look so good, my mouth is watering. 3. The secret to Peeps Whoopie Pies, Peeps Brownies, Peep Milkshake, and Strawberry Marshmallow Shortcake brought to you by GoodHousekeeping.com. 4. Or, you can purchase a Peeps cake mold measuring 7 x 10 x 3-1/4 inches and come up with your own creation. Projects 5. Didn&apos;t your mom always tell you not to play with your food? Well with this recipe, you&apos;ll learn how to make play dough out of Peeps! Sorry, mom. 6. And, here’s another play dough recipe with a science video to boot! It&apos;s not Bill Nye, but still effective. Facts 7. Mentalfloss.com has rounded up "20 Delicious Facts About Peeps." My favorite has to be that 37,000 Peeps weigh about as much as the boy band, One Direction. Really? That is one piece of information that my brain did not need to know. 8. 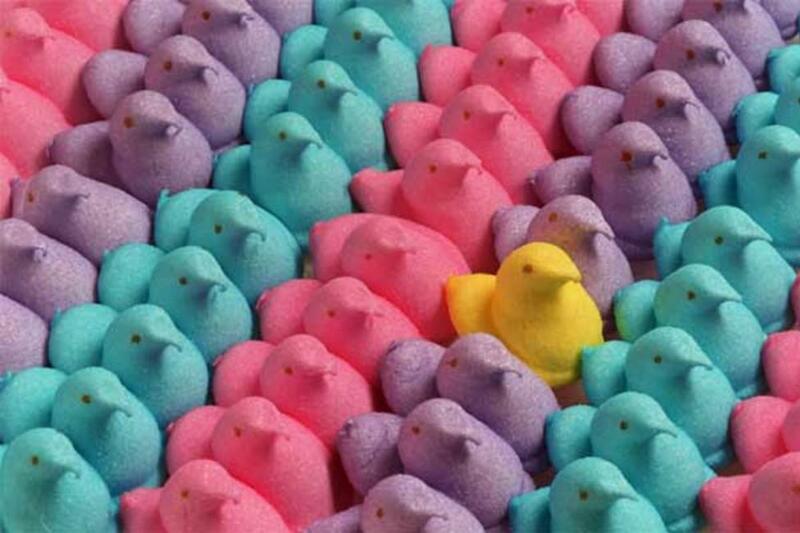 Even AARP has come up with “11 Things We Didn’t Know About Peeps.” I’m curious, how about you? Do you think they will make us live longer if eaten daily? 9. 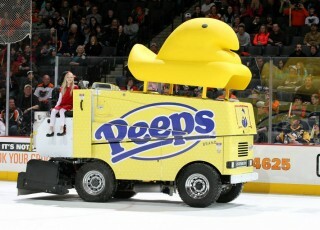 Yahoo Sports took note to the newest Peep to hit the streets, or I should say ice. The Peeps Zamboni is being used at the PPL Center in Allentown, Pa., home to the Lehigh Valley Phantoms (AHL affiliate of the Philadelphia Flyers). 10. ABC’s The Chew had some fun on a behind-the-scenes tour at Just Born to see exactly how they are made. Public tours aren&apos;t currently offered for food safety issues but, imagine the smells in that place! 11. Jimmy Kimmel and Guillermo did a little taste test of the all-new Peeps milk. Yes, you heard that right, chocolate, egg nog and vanilla flavored milk. Go, run to your local grocery store immediately. You wouldn’t want to miss out on this stuff. 12. And, a little more Jimmy Kimmel love with the judges from American Idol giving Peeps milk a try. We secretly think Jimmy loves the stuff! Wink, wink. Movie/Song Remakes 13. In case you missed the Oscars this year, don’t fret. We’ve got you covered with the remakes of each of the winners, using no other than Peeps. 14. Here’s a music rendition of People by Barbra Streisand from the movie Funny Girl. It also incorporates a pretty intense diorama! Short homemade video creation 15. You won’t want to miss the tiny Yorkie puppy who turns into a giant Peep that has almost 900,000 views and was just published a couple of weeks ago! Gotta love teenage girls’ creativity. Official Store 17. If you can’t find enough merchandise in your local grocery store, then head to the Peeps & Co. store in Bethlehem. You’ll find everything from cat and dog toys to silver bracelets for your special someone. Books 18. Yup, you guessed it. People have created books about Peeps. This one rounds out at 112 pages. Who knew you could keep anyone’s attention that long about marshmallow candy? 19. This book sounds a little more interesting as it incorporates recipes and craft projects. Party Ideas 20. 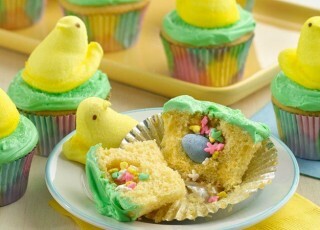 And, for those of you that want to throw the ultimate Peeps party, you just have to check out this blog. I want to be a kid again with ideas like these!